The simple, humorous and social travel-themed card game that is also a card game made for travelers! 3,778 backers pledged $113,366 to help bring this project to life. We've also put up a robust official website with detailed rules, FAQs, videos, and anything else you might need. You voted, you decided! The new country cards will be Thailand, Cuba, Maldives, North Korea, Russia, Japan, Scotland, Iran, Turkey, France, Madagascar, Australia, and Papua New Guinea! PASSED! $27k - Free Amikumu one year gold membership! Our friends at Amikumu, the Tinder-for-language-learners app, have offered everyone who pledges $24 or more a free gold membership for a full year! Here's a fun video that explains everything. PASSED! $35k - 6 more passport cards! We can now afford to put the rules on a small leaflet in the deck instead of printed on cards, giving us enough cards to design and print 6 more passports for variety and fun! You voted again, you decided again! The new passport cards will be Uganda, Nepal, Tajikistan, Oman, Vatican City, and the fictional "country" of Esperantujo. PASSED! $40k - Signed deck reward! New limited reward to get your copy of Itchy Feet: the Travel Game signed by me, Malachi! It covers shipping and handling to put me in a big box and send me to the fulfillment center. PASSED! $45k - Itchy Feet t-shirt and Kickstarter-exclusive Omnibus Anthology Book of comics! New combo reward! A big fat Kickstarter-exclusive Itchy Feet book with every comic from the Vol. 1-3 anthology, plus Volume 4, PLUS the yet-unreleased Volume 5, including all 30 mini-comics from Itchy Feet Month! It's literally every comic released up until the end of the campaign, and it'll only be available this way to you backers! PASSED! $100k - Durable, travel-friendly box and improved playing cards! First, no more floppy tuck box. We'll get a thick-as-nails, board game-style box with the same art but able to take a beating on the dusty trail! Second, we'll print on much thicker card stock with a better plastic laminate. It'll ensure your Itchy Feet cards last longer, can withstand beer spills and scratches and other travel damage! $24 - Globetrotter. This is the game! $39 - Glamper. This is the full game, signed by Malachi Ray Rempen, co-creator of the game and author of Itchy Feet! FREE worldwide shipping for the cards AND the book! $89 - Super Itchy Feeter. By popular request, the ultimate fan package! UPDATE: the Omnibus now includes several pages of behind-the-scenes material, and YOUR NAME printed inside! If you are confused by all this, don't worry! At the end of the campaign, we'll have a pledge manager (CrowdPilot) which will help you sort out exactly what you want. No stress! I will design a character card based on your likeness (you'll have to send photos and a description of what you want) including your own unique ability (shipped separately). Also makes a terrific present! $40k Stretch Goal UNLOCKED: Great news! Now your deck comes signed by Malachi Rempen, co-creator of the game and author of Itchy Feet! We have a "Sponsored By" card with 3 spots on each side (6 total). Your logo (and accompanying text, if you wish) will appear on one of these slots, delivered inside every copy of the game! We'll also put your logo on the website, where players go to consult the rulebook, in a special "Sponsored By" section. The logos will link to your content. And you get a copy of the game, of course! Note: Itchy Feet's audience is travelers and language learners. If your company or organization shares that audience, then this is the reward for you! Update Note: the text in the reward box above on the page says there are 24 slots on 2 cards, but we have reduced this to one card with 8 total slots to make room for more passports as per our $35k stretch goal. An entirely customized Itchy Feet card game: I'll make an Itchy Feetized character in your likeness, then replace every instance of the Itchy Feet guy on the cards with your cartoony doppelgänger. The ultimate, one-of-a-kind, personalized deck from yours truly, with 1,000 thanks! If you're opposed to these things you will NOT like this game. When someone suggested I make an Itchy Feet-themed card game, I loved the idea but had no idea where to begin. Lucky for me, Canadian game designer, polyglot, traveler and all-around lovely human being Maxime Rioux (above left) volunteered his services. For more than a year and a half we've been brainstorming, designing, scrapping, re-designing, experimenting, tinkering and testing, testing, testing. We started long distance (I live in Germany, Maxime in Quebec), using a half-defunct web-based software called Tabloro to fiddle and test, including many very fun sessions with Itchy Feet fans over Skype (thank you, friends!). Then we played with handwritten flash cards, refining and re-jiggering and trying new ideas. We've been absolutely ruthless with it, only hanging on to the very best parts and cutting away any and all fat. Neither of us are huge gamers, so this was a high bar. It had to be something that we would love. With Itchy Feet: the Travel Game, we really believe we've succeeded. Our testers have been knocking our door down, wanting to keep playing. Everyone who's played it has been bowled over by its charm, simplicity, and good fun. We really think you're going to enjoy it, too. The game is finished and ready to go, so I'm confident we can make this happen. We are working with experienced manufacturers and fulfillment companies that have done Kickstarter card games many times before, so we've already figured out our production and shipping strategy. But that said this is my first card game and first Kickstarter campaign, so I'm learning a lot, and I'll probably make mistakes. Luckily I've got incredible support from colleagues who have already completed successful Kickstarter campaigns (looking at you, Awesome Shield and Amikumu), as well as the fantastic community out there that I've pestered so much with my questions and requests over the past year. You get a 100% pure genuine organic Thank You, as well as ongoing updates from the campaign. For this amount you'll get a PDF version of the game for you to print out, assemble and play at home. Full Game + FREE Worldwide Shipping! You'll get a copy of ITCHY FEET: THE TRAVEL GAME including all five extensions, the Kickstarter exclusive, and FREE shipping to anywhere in the world! To order multiple copies (makes a great gift!) just add $24 for each extra deck you'd like. Full Game - Signed Deck! Pledge this amount to get your deck signed by Itchy Feet author and co-creator of the game, Malachi! This is a LIMITED reward, so if you want the book as well please change your pledge to THIS one and add $25 for the book (sorry, I can't sign the books!). Limit one signed deck per backer. For additional normal decks, add $24 per copy. If you got the $99 reward, DON'T change it - your deck will come signed anyway! Full Game + Itchy Feet Comic Anthology! Get the full game, and a copy of Vol 1-3 of the Itchy Feet comic - 150 pages of full-color travel and language delightfulness! To order multiples, just add $49 for each extra deck + book you'd like (book ships separately from game, but shipping is free for both). Signed Game + Omnibus Book + T-Shirt! By popular demand - the ultimate fan package! You get a deck, signed by the creator. 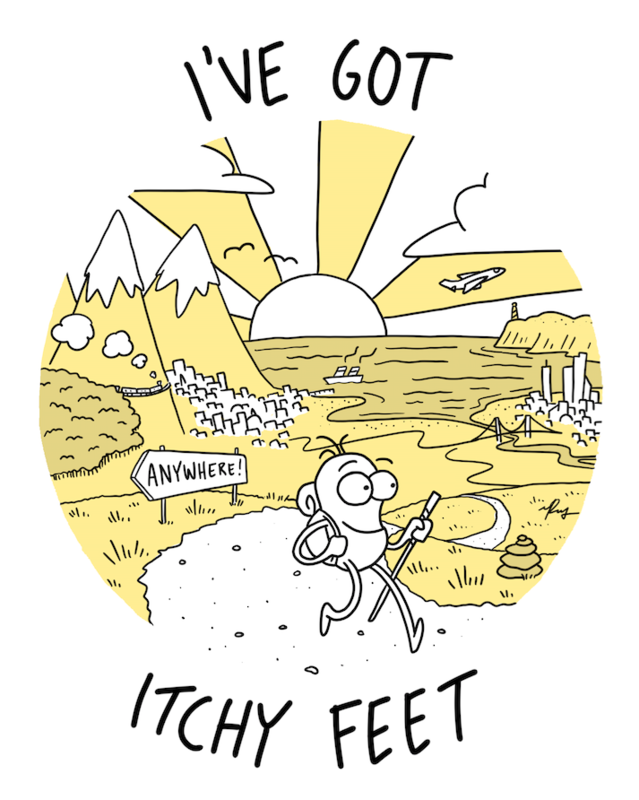 You get a Kickstarter-exclusive omnibus book of EVERY Itchy Feet comic including Vol. 1-3, Vol. 4, the as-yet unreleased Vol. 5 and ALL mini-comics from this month. And finally you get a t-shirt with a wanderlust-inspiring Itchy Feet design! Hot dang! And worldwide shipping is FREE! Kickstarter-exclusive Omnibus Book (250 pages of color comics)! Full Game + Personalized Character Card! For retailers, collectors, or anyone stockpiling their nuclear bunker. 10x copies of the full game + all extensions! Your logo will appear on one of 24 spots on a non-playable "Sponsored By" card, shipped inside every copy of the game. If you want your logo to take up two or more slots, you can! Just use another account to pledge at this reward tier and mention it's for the same company or org. The entire deck, personalized just for you. Only one will be printed!